Please see Part 1 of this article for information on the natural history and captive breeding of the brilliantly-colored Strawberry Finch (Amandava amandava). I relayed there that my first experiences with wild-caught Strawberry Finches left me with the impression that they are among the world’s most spectacularly-colored birds. However, captive-born individuals, while beautiful, often fall far short of the color standards set by their parents…today we’ll take a closer look at this phenomenon. 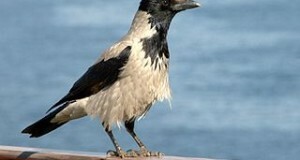 Color loss in some bird species is well-understood and easy to correct. For example, captive Flamingoes fade to near-white if denied small red shrimps (or a substitute), as their plumage color is at least partially linked to the diet. Red-phase Canaries, on the other hand, derive their color genetically through hybridization with the Red-Hooded Siskin (a South American relative). Strawberry Finches, however, are somewhat baffling. A number of explanations for color loss in captive-born Strawberry Finches have been put forth, and many breeders and zookeepers have tricks designed to rectify the problem. Genetics and natural variation among different populations may play a role. Many believe that certain Chinese populations of the subspecies Amandava amandava flavidiventris are naturally of a darker red than others. 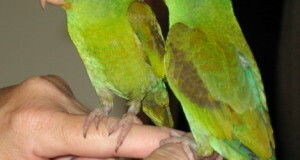 Captive pairings with the other 2 subspecies may have resulted in bright feathers that fade after several generations if birds of Chinese origin are not continually added to the breeding stock. Some folks are convinced that temperature and humidity influence feather color. Warm temperatures and humidity levels of 70-80% are believed to encourage bright red feathers. Full spectrum light may also play a role. For some reason, breeders considered this to important to the Strawberry Finch’s care years before its role in bird husbandry was fully appreciated. Certainly, many have noticed that the plumage of birds housed outdoors usually outshines that of their house-bound relatives. Casual observation and experience seems to indicate that Strawberry Finches need a greater variety of foods than do many other popular species if they are to remain healthy (of course, appropriate dietary variety is beneficial to all birds). The effect of diet upon color has not been established, but many believe there is a link hidden somewhere. Insects should be available year-round. Small crickets, mealworms, waxworms and wild-caught moths, beetles and others are all eagerly accepted and may help in maintaining color. Egg Food and Softbill Select serve well as high-protein treats, and sprouts will add important nutrients to the diet. 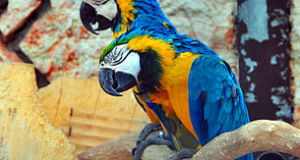 Avitron Vitamin Supplement will help ensure that your birds remain in the peak of good health and color. When I first began working alongside older, well-experienced bird keepers, I was surprised to learn that many fed dried shrimp to their birds (even species that did not eat aquatic animals in the wild) in order to improve color and health. Strawberry Finches are good candidates for this novel food item – please see the article below for details. Tips from the past feeding dried shrimp to finches and softbills. Strawberry Finches and other birds at the Bloedel Conservatory.